If you have a hard limit on how much can be stored on-prem in Outlook, or have an annoying .ost file that is taking up space no matter how many times you rebuild, then one of the more viable solutions may be to archive more messages onto Outlook online and reduce your mailbox size. You can access your archived emails in your Outlook as well as online via webmail. You can access your webmail at https://outlook.office365.com/owa/. Please keep in mind that sorting mass amounts of email at once will crash your outlook. After you complete the archive of your emails, mailbox maintenance will prevent these issues from occurring in the future as well as speed up your Outlook. This can be obtained by continually deleting unimportant emails, archiving important emails, as well as emptying your trash bin regularly. You can empty your trash bin by selecting file > cleanup tools > Empty Deleted Items Folder. 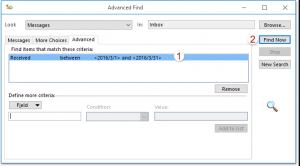 Create your desired folders under Online Archive, which is located at the bottom of your list of inboxes. This is done the same way you create folders in your normal inbox. The emails that fit into this criteria will show at the bottom of the window. Select the emails you wish to move by selecting the top one, holding shift, and selecting the last email you wish to select. This should select all emails between those two emails. Right click on the email chunk you selected, click move, and select the desired folder. Folders will be labeled when they are Online Archive. After the page finishes loading, the emails have been moved to the archive and they will not disappear from your search list. It may look like nothing has happened, but you can verify they have moved by looking to the archive folder to confirm they are there. Month by month may be an effective way to move emails into your archive and will be easy to track. Please let me know if you need any further assistance with this or clarification on the instructions.